Sometimes all I want to cook is something simple, something that all goes in the one pot. 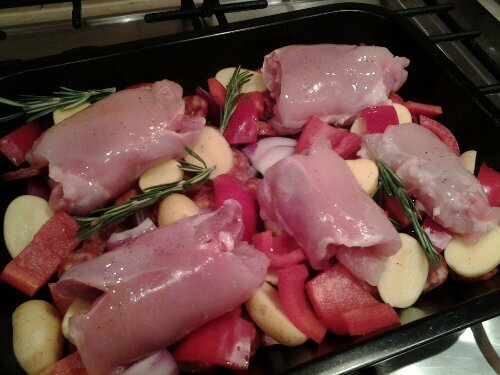 While I enjoy the effort and time that goes into a demanding labour of love such as risotto, it makes a nice change to chuck some ingredients in a roasting tray and stick it in the oven. I totally love chorizo and it goes into quite a few of my dishes, including this one. Preheat the oven to 220 C/200 C Fan/Gas Mark 7. Put the garlic and onion into a roasting tray, then sprinkle the chorizo slices over the top. 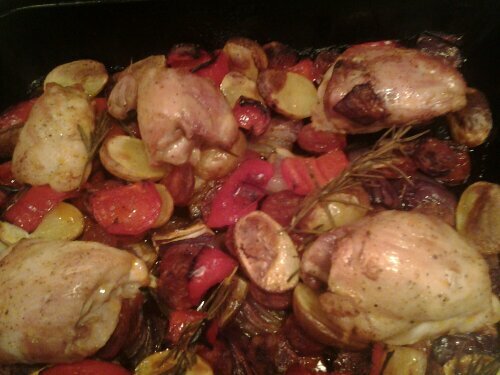 Put the chicken pieces in the tray and then add the pepper, potatoes and rosemary. Drizzle the olive oil over the tray, and roast in the oven for 45 minutes. Halfway through cooking, baste the tray contents with the oils that have come out of the chorizo. After cooking, discard the garlic and rosemary, and serve. If there are any juices left on your plate when you’ve finished, mop them up with some crusty bread.